Norwegian incumbent Telenor has undertaken a survey, which found that 88% of all Norwegian 10-year-olds own a mobile phone, up 36% from 4 years ago. 9-year-olds are at 71% up from 57% last year. 60% of the kids teach their parents on how to use the thing... The leading "subjects" that are "taught" are camera, downloading music, SMS, Internet, MMS, video and radio. Heavy users then... The whole concept of digital natives (vs. immigrants like me) may stand to be corrected (after a mere 5 years): are we now talking of mobile natives? Whilst in the good old days of 2001 Prensky (the inventor of the digital natives concept) mused that children, at the age of 15, would only have spent about 5,000 hours of reading vs. 10,000 hours of having played video games plus 20,000 hours of TV, this seems to shift, and not only in Norway: e.g. does my son (12, no 12 1/2 [! ], with his own phone since he turned 11) check his e-mail only once every blue moon (it's so yesterday! ), the most important pieces of communication are IM and his phone. He has a Facebook account (even asked me if I would allow him to cheat on his age - you have got to be 13 to sign up), which he rarely uses though (this will change, I'm sure. He is utterly annoyed that I would not buy him an iPhone -- because then he could IM and use FB and others on the move, too. Note to self: why are dads so stubborn, backward and generally obnoxious?). He is not really that interested in the XBox360 that was -- rather cunningly -- given to his dad as a Christmas present last year so as to be better able to regulate usage. Take away his phone though? Oooh. Besides causing all sorts of concerns as to costs, imaging (could they actually look at "dirty" things earlier? well, according to that survey, 80% of all phones are registered by a parent, which means that they probably would pass through age-restriction-barriers; not my son though: his nasty dad signed him up to a no-data plan...) the much more interesting thing appears to be the actual shift in the ways how youngsters communicate and consume and compute information: communication via mobile (or IM for that matter) is normally limited to a radically reduced amount of information being shot back and forth in incredible intervals (I actually struggle to read my son's IM conversations with his friends: "hi m8, let's mt @4 in S park, s8ing should be cool td"). So arguably the information they consume is received (and presumably processed) in smaller chunks compared to previous generations. The Guardian (or, in the US: the NY Times) anyone? Will this also extend to the way the next wave of savvy users will consume mobile content? Will that mean that they're less inclined to play 18 levels of Call of Duty because it is too linear in gameplay? May, in a few years time, that (and not the 39-year-old mums) be the reason why quick and easy games may be more successful on mobile (as they are - probably for different reasons - today)? Prensky concluded that his students' brains had physically changed. What he meant is that children who grew up with digital media (I was a front-runner of my generation having played with my dad's punchcards) compute information differently to people who grew up in an analogue world. After a mere 6 years, this seems to have shifted again, this time involving the constraints of the mobile screen but adding several layers that are inherent to that medium: location-sensitive, instant, anytime. Ah, what interesting times! OK, but now back to Telenor's survey. 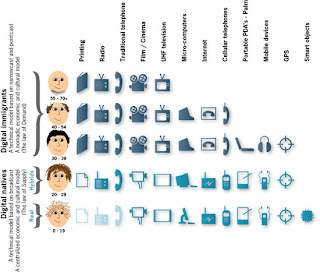 Interestingly perhaps, it also shows that attitudes as to when children should have a mobile have changed considerably. The threshold for mobile phones is now 10 years of age, and the percentage of parents who think it is acceptable for their children to have a mobile, more than doubled from 9 to 10 (22% for the younger ones to 56% for 10-year-olds). Is this related to the entry into secondary schooling (it was for us)? 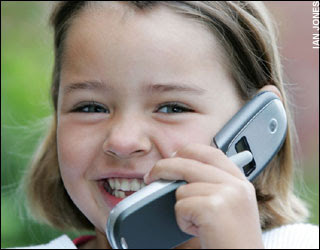 In 2002, only 11% of parents thought it were acceptable to give a 10 year old a mobile. Interestingly, parents seem to give their children mobile phones before the parents actually think they should have any (are Norwegian schizophrenic??? ): 93% of 11-year-olds have a mobile, only 63% of parents say they actually want them to have one at that age. So who on earth gives them these things?? ?